Microsoft today set July 29 as the launch date for Windows 10, saying that customers could begin installing the free upgrade on existing PCs, 2-in-1s and large tablets that Wednesday. 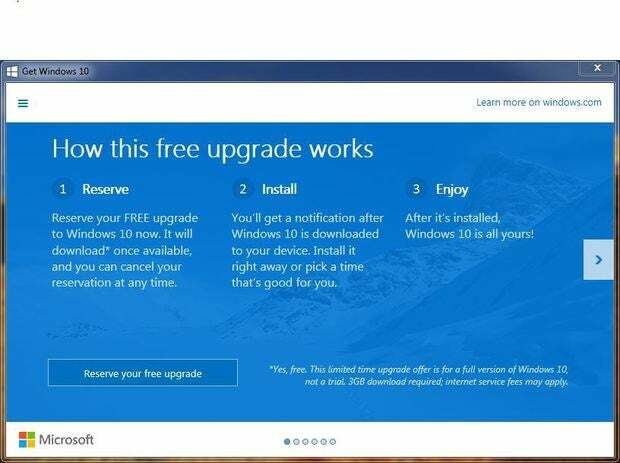 "This is a full version of Windows, not a trial or introductory version," a FAQ on the upgrade offer said. "It is available for a limited time: You have one year from the time Windows 10 is available to take advantage of this offer." The end date for the free deal will be July 29, 2016. Microsoft remained silent on a host of questions regarding Windows 10 in general and the upgrade specifically, however, including how long consumers and small businesses -- those eligible for the upgrade -- will receive free updates and further feature and functional upgrades. The Redmond, Wash. developer continued to use the phrase "for the supported lifetime of your device" to describe that length of time. Microsoft has yet to define "supported lifetime." Consumers and small businesses running Windows 7 or Windows 8.1 can 'reserve' their copy of the free Windows 10 upgrade through the now-active nag campaign running on their devices. "We will continue to update Windows 10 over time with new innovations to help you be more productive and have more fun," said Terry Myerson, Windows' chief, in a Monday blog. "Like Windows 10 itself, these updates will be free for the supported lifetime of your device [emphasis added]." Microsoft has provided hints of what that means. In a conference call with Wall Street analysts in late April, the company said that the timetable would depend on the device type. A tablet, for instance, could top out at a two-year support lifetime, while a notebook could be pegged at four years and a 2-in-1 device at three. Or Microsoft could define form factor by screen size, as it already does to some degree. The late-July availability of Windows 10 will precede that of Windows 10 Mobile -- the edition slated for smartphones and smaller tablets -- by an unknown stretch: Myerson said nothing about Mobile's launch date. People running Windows 7 Service Pack 1 (SP1) and Windows 8.1 -- the latter must have had the April 2014 update applied -- will be able to "reserve" a copy of the free upgrade through the "nag" campaign that Microsoft has installed on their machines in a series of updates since late March.